CTP Colorado heat treats everything from highly sensitive aerospace aluminum, cast aluminum, bar stock and precision-machined parts to bicycle frames. Aerospace treatments meet all AMS standards including AMS 2770 and AMS 2771. Specialties include uphill quenching and thermal cycling in furnaces that range from -200°F to 500°F at controlled rates of cooling and heating. Although aluminum typically distorts upon quenching, we are very good at minimizing that distortion, so that even your most delicate parts come back dimensionally correct and fully qualified by our staff. You are free to straighten your own parts at our shop, should you prefer. 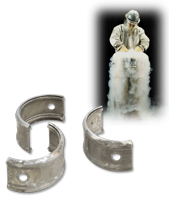 We offer extensive expertise in dry-hydrogen furnace brazing. Induction and torch braising are also available in air or controlled atmospheres. 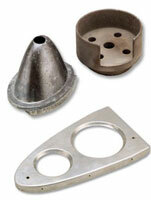 Assembly service includes application of appropriate brazing pastes and coatings. CTP Colorado excels at bright aging a wide range of exotic alloys to meet Inconels 17-4, 15-5, 13-8 and AMS 2774 standards. Tool steels are cryogenically treated to ensure maximum performance, dimensional stability and superior cleanliness. Procedures include stress relieving and annealing for 300-Series stainless steels. Parts stay bright and shiny in dry-gas controlled atmospheres. Cryogenic treatment is standard on every job with consistent results assured from one order to the next. Temperature Processing provides a variety of thermal cycling and cryogenic treatments from uphill quenching to controlled rates of cooling between -320°F and 500°F. Industries served include aerospace, automotive (on- and off-road vehicles) and firearms. Cleaning eliminates every trace of plastic, carbon, and other residues. In partnership with cleaning specialist Steve Kelly of Western Texturing, clean molds are delivered to your door in like-new condition, ready to be assembled, calibrated and returned to production. 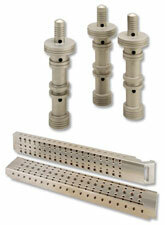 Hot-runner manifold cleaning saves you hours of chipping resin and eliminates the risk of damaging valuable tooling.